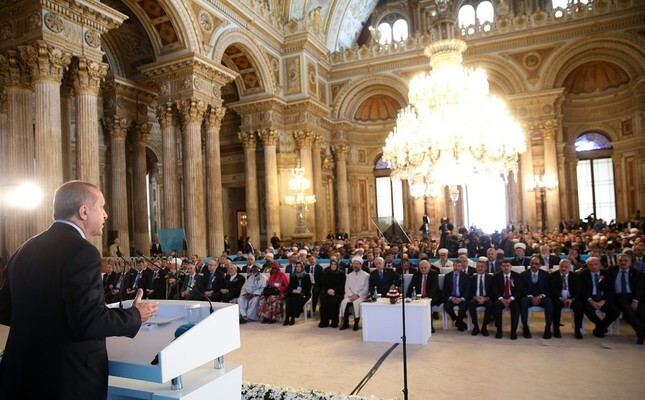 President Erdoğan addresses delegates from Muslim minorities at an event held at Istanbul's Dolmabahçe Palace. The World Muslim Minorities Summit opened in Istanbul yesterday amid President Recep Tayyip Erdoğan's strong criticism of the West's anti-Islam sentiment. The four-day event, organized by the Presidency of Religious Affairs (DİB), brings together representatives, academics, experts and journalists from 100 countries where Muslim minorities live and focuses both on the internal problems of the communities and the challenges they endure in the face of Islamophobia. On the first day of the summit, the participants discussed the past and future of Muslim minorities and today, they will debate issues ranging from freedom of minorities to radicalization. On the third day, problems regarding religious services and maintaining religious education will be discussed. The summit, the first of its kind, aims to boost ties between Turkey and Muslim minorities under the motto "The Believers are but a single Brotherhood." In an opening speech, Erdoğan lashed out at the West for stoking anti-Islam sentiment in its bid "to impose its own ideology and lifestyle." Known for his frank criticism of what he calls the hypocrisy of Western countries who are turning a blind eye to their histories of colonialism, Erdoğan said they wanted to stain Islam through "terrorist groups engineered to accomplish that." The president said attacks against Muslims and refugees has become "an ordinary thing" in many countries championing democracy and law. "Racists and fascist groups target businesses, homes and places of worships belonging to Muslims, particularly in Germany, the Netherlands, France and Belgium. Muslim women are harassed because they wear headscarves, for instance, in France," he said. Erdoğan pointed to the multi-layered, multi-sided wave of attacks against Muslims in the post 9/11 period "through gangs with blood on their hands." "Terror attacks by Daesh, Boko Haram, al-Shabab, FETÖ, etc. both harm us and give opportunities to anti-Islam circles to defame Islam. They ask: 'How come Muslims do not shed blood? Isn't Islam a religion of peace?' They ignore the plight of Muslims and the slaying of Muslims by those groups. On the contrary, they hold Muslims accountable for these brutal murders. Most Western countries, in a bid to smokescreen their internal problems, stoke this fire," he said. He lashed out at "seemingly clean" countries with histories of massacres and immorality. "I asked one of them in a phone call recently why they didn't account for killing 5 million in Algeria," he said, referring to a conversation with French President Emmanuel Macron. Ankara has stepped up rhetoric against rising anti-Islam sentiment particularly in Europe and Parliament's human rights committee launched a probe into Islamophobia on the continent amid reports that in Germany alone, some 950 Muslims and Muslim institutions faced attacks in 2017. Erdoğan complained about double standards when it comes to the lives of Muslims. "We know how Western powers are irked when their interests are disturbed. When it comes to market sharing or acquiring oil, gold and diamond reserves, they are like sharks attracted to scent of blood and go thousands of kilometers for their interests while turning a blind eye to the massacres in Palestine, [Myanmar's] Rakhine and in Syria. They only think about grabbing the resources of a country under the guise of fighting Daesh and endorsing new terrorist groups for their own purposes," he said in a thinly veiled reference to the U.S. support for a PKK-linked group that Turkish troops fought in Syria. "The world is bigger than five" is the famous motto Erdoğan has repeated in speeches in reference to the world powers' monopoly in the United Nations Security Council and was once again highlighted in the president's speech at the summit. "We always said the United Nations needs reforms. Alas, even leaders of Muslim countries cannot comprehend what we advocate. They got used to the policy of enslavement and do what they are told [by the West]. We don't live in the post-World War II period anymore. We need to build a new world," the president stated. He also touched upon the U.S. and its allies' recent military strikes in Syria in response to the Bashar Assad regime's chemical attack in Douma. "Muslims have failed to resolve their own problems and those outside Islam try to 'solve' it. This is when barrel bombs start dropping. They say it is a reaction to a violation of a convention on chemical weapons. It is a crime no matter what kind of bomb kills the people. Chemical weapons killed people but conventional weapons killed hundreds of thousands of others too. They never speak about it," Erdoğan said in his criticism of Western powers taking action only when the Assad regime used chemical weapons.